Hi and welcome back! 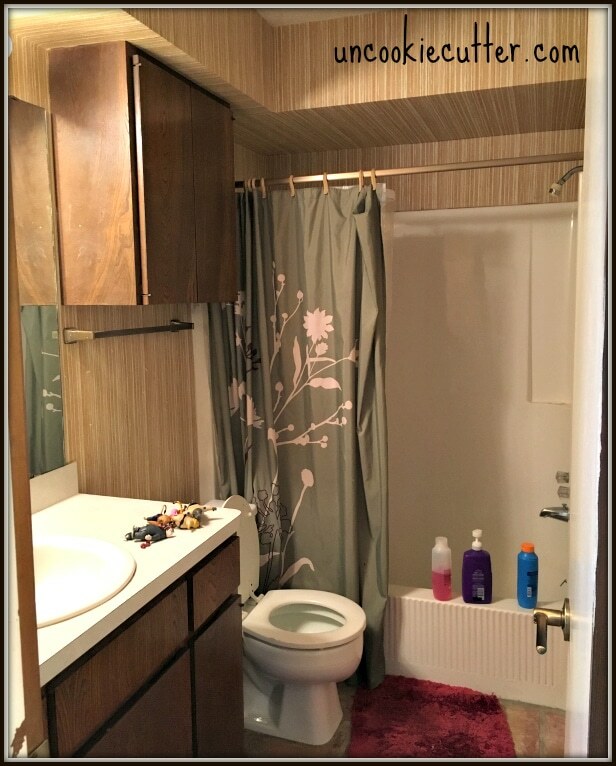 I am participating in the One Room Challenge from Calling it Home this fall and we decided to gut our guest/hall bathroom. 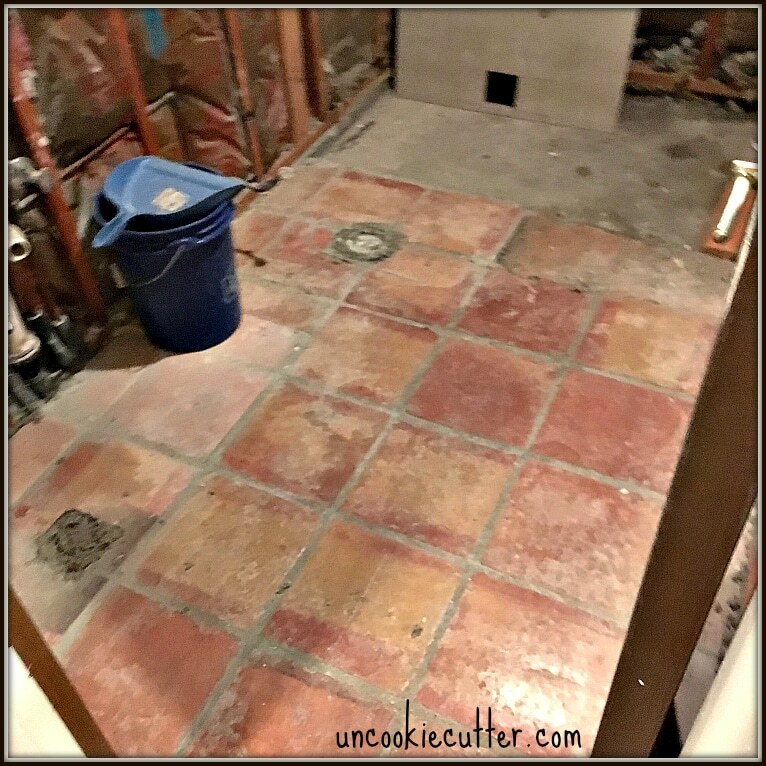 It seems like we are moving right along with this hall bathroom makeover, which scares me because that is usually when things start to head south :). 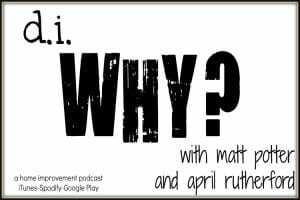 In case you missed it last week, here is what we started with. So the first thing we did was gut the entire space. This post may contain affiliate links for your convenience. See my full disclosure policy HERE. After this photo, I ripped up all the tile to get ready for new tile. So, you’ll notice we ripped out the tub and shower as well. We are going to put a walk-in shower here. We installed a new seamless entry shower pan that is ready for tile. The company that makes it is actually called Tile-Redi, funnily enough. We moved the shower head to the ceiling but left the drain where it was, just to save some money. The idea is to make it completely seamless with the tile floor going all the way into the shower. 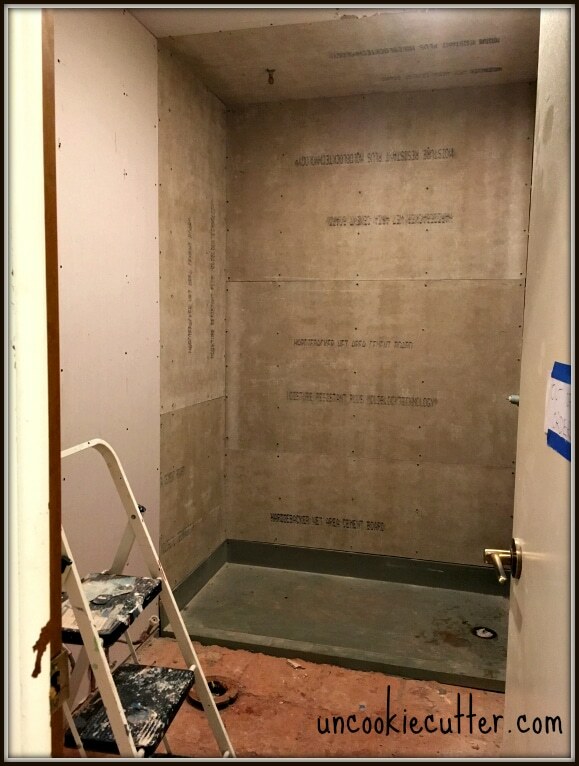 We installed cement backer board inside all the shower walls, where the tile will go and replace all the old, beat up sheetrock with new sheetrock. The cement backer board gives and extra layer of water protection, you can read more about installing backer board HERE. Then we built the wall. Okay, to be honest here I did have my contractor help me a bit. 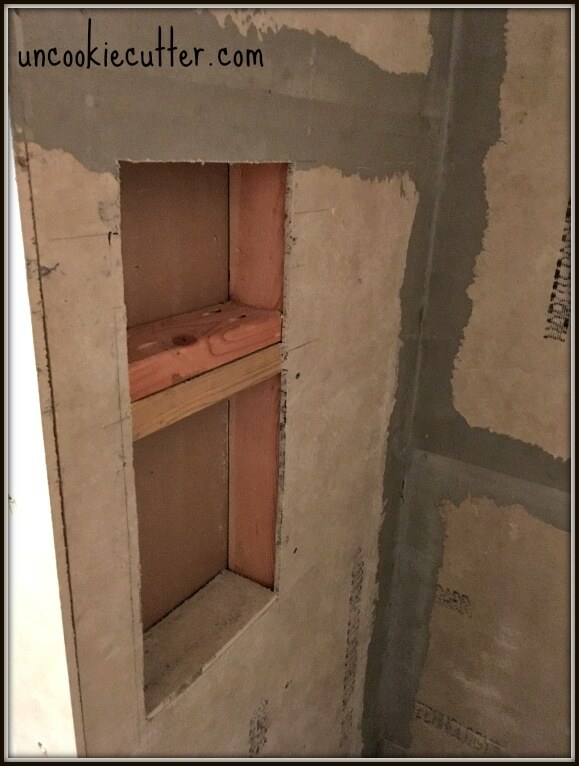 He moved the plumbing and installed the shower pan and built the wall. I wasn’t comfortable getting the pipes moved and done, so that is something I can’t walk you through. It is great when you find a great contractor that will work with you. He steps in and does what I can’t, but now he’s pretty much done so the rest is up to me :). 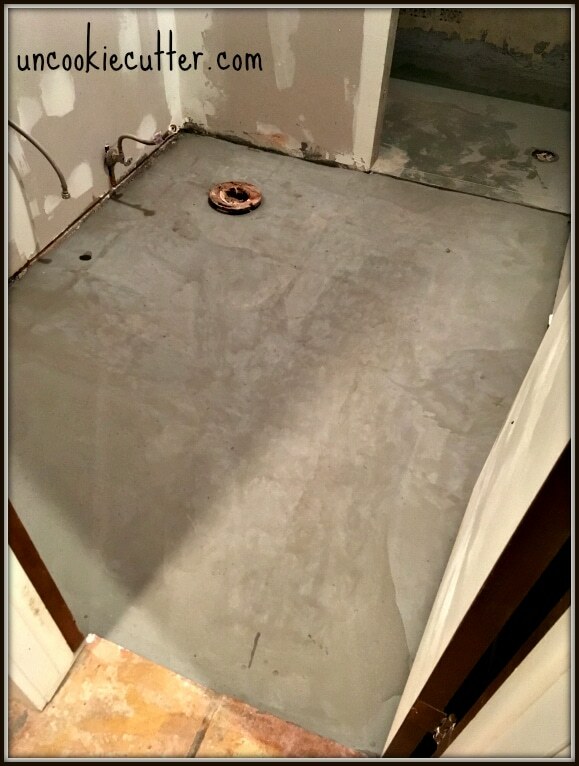 Next, I used self-leveling concrete to prep the floor for tile. It was actually pretty easy and I wrote a post about that yesterday HERE. I also decided last minute that I wanted an alcove for shampoos and soap and so I’ve been working on that today. Hopefully, I’ll have a tutorial next week on that. It turned out to be a bit more than I bargained for. Next up: finishing the alcove and then tile! Fingers crossed that’s all done by next weeks post! 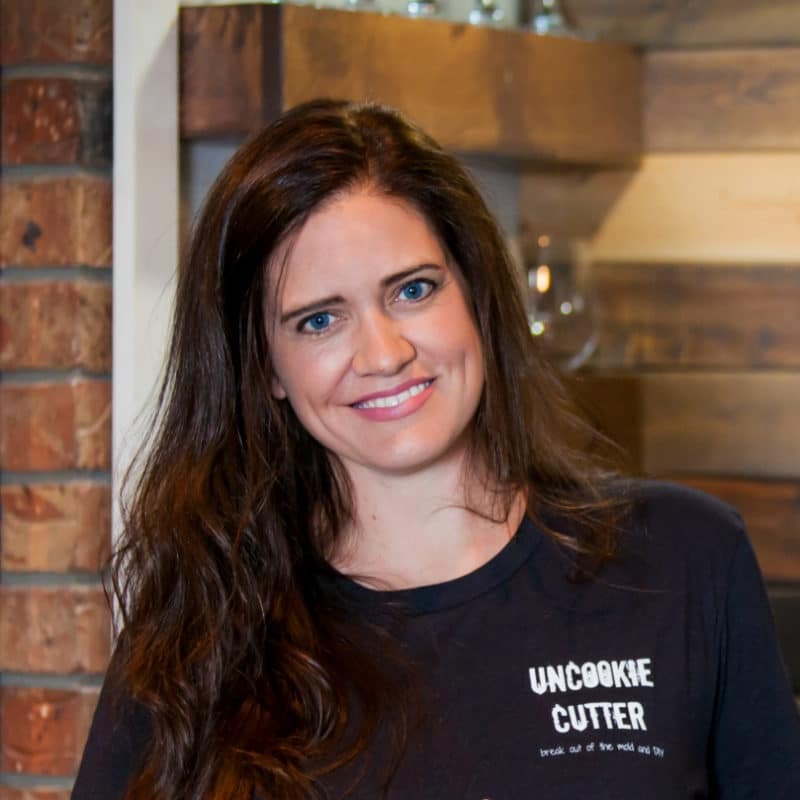 I’m so excited to be working with some great companies for this little bath makeover. 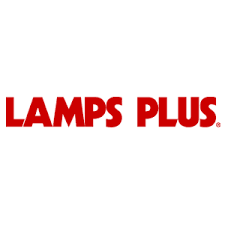 The quality of these brands is really top notch, so stop by and give them some love from me! 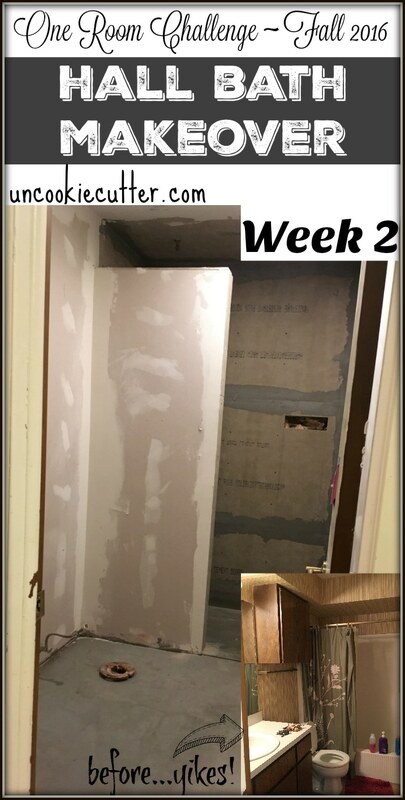 Thanks so much for stopping by and checking out our hall bathroom makeover progress! This is going to look great. I love that added the alcove on the wall. On TV is always looks so easy! HA! famous last words. Yay! It’s looking about the same as my bathroom right now, haha. We actually bought a little insert thing for our alcove and it was shockingly easy to install. Good luck with tiling – it’s SO much more rewarding than that dang backer board! I can’t even talk about the inserts 🙂 🙂 :). I started a little early, so I cheated a little ;). But, from here on out it’ll be real time! Thanks for stopping by! Exciting!! This is going to be great. I loooove your ambition girlfriend! Shared! It’s looking great! 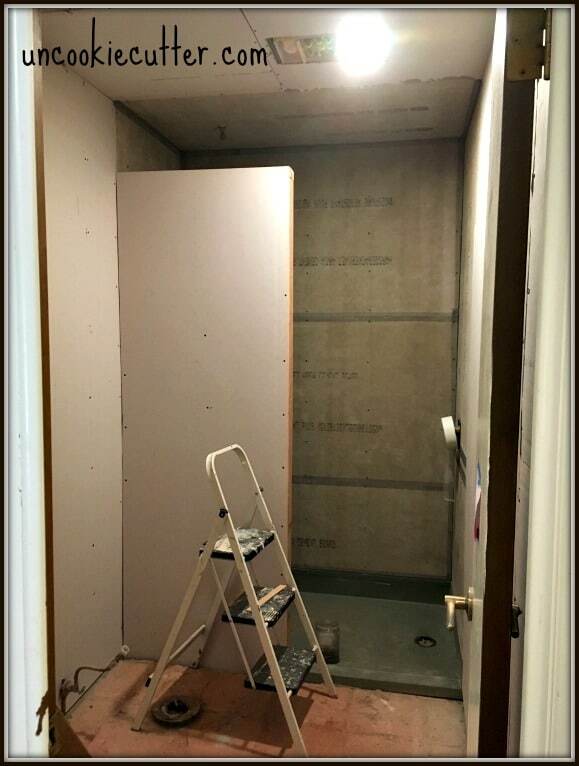 The shower stall is going to be just perfect in there.. I’ve felt the pain of the alcove myself! Who knew creating a box was so involved? Keep up the good work! You are making great progress, April! I love the walk-in shower; it’s such a seamless look! If I can get it to work, it’ll be great, haha :). Bathrooms are so much work, it looks like you’ve gotten a lot done already! I can’t wait to see it finished! It may look bare-bones, but I see a lot of progress here! They say it has to get worse before it gets better, but I think even this is an upgrade :). Thanks Sarah! You’ve gotten so much done in such a short amount of time! Love the little place to put shampoo, etc. We added one for our bathroom reno and use it constantly. It will be worth the work in the end! boy, I hope so :). Thanks for stopping by Sarah! You have done so much! This will be amazing once done! Thanks Emily! Feeling the stress about now!